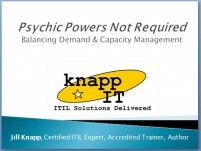 Online learning « Knapp I.T. Many of my fellow freelance instructors love the convenience of teaching via an online modality (Webex, NetMeeting, Elluminate, etc.). Online classes mean that instructors can teach from their home offices, and students can take the class from anyplace with a ‘net connection. On the surface, it sounds great. Nobody pays for travel, and the instructor gets to wear bunny slippers; everyone wins! :-) Except… not. Student pass rates are lower when students take the class via an online method. Why is that? My best guess is student engagement. When sitting in front of a PC with speedy ‘net access all day, it is pretty fair to assume most students are going to play with Facebook in another tab. ITIL is a dry topic, and even the best instructor is no match for Farmville. I’m known for talking with my hands almost as much as I do with my mouth. I flail, I point at things, I gesture and jump around while I teach in a classroom setting. I also hang things on the walls that represent different phases of the service lifecycle, so when I say “Service Design” I can point to that phase and students can quickly remember what Service Design looks like and how it fits in with everything else. The problem is, some of that isn’t really possible via online learning. The flailing works OK, but the pointing at things hung on the wall… not so much. Students simply cannot get the same quality of training via an online method as they can in a classroom. Any sales rep that says otherwise has never taken ITIL both in a classroom and via online-live and then done a comparison. This means they are trying to sell you a product they don’t understand. This is not cool. To be fair, I think online training works great for certain types of training; lab-based training (e.g., Outlook) is fine… but lecture-based? No way. Again, sales reps will think the opposite: “Lecture-based classes are the obvious choice, because students don’t have to do anything but sit back and absorb.” Not true. Lecture-based classes like ITIL Foundations work much better when the instructors and students can have a dialogue; exchanging ideas, questions, group exercises, conversations with body language, nuances, expressions, and laughs. We need to apply this ITIL stuff to students’ lives or it isn’t going to stick… and it’s hard to do that even with sophisticated systems with tons of interactive functionality like WebEx and Elluminate. There simply is no substitute for being in a classroom for a topic such as ITIL. Some training companies offer online training at a reduced rate, which I think is terrific. Students aren’t getting as much, so they shouldn’t have to pay as much. Training companies that offer no discount for their online training vs. their in-person training are slimy. Don’t choose them. It’s like paying for a 1.75 quarts of ice cream and only getting 1.5 quarts. Sneaky. Uncool. Service Level Management teaches us that customers can have anything they want, provided they pay for it. You want fresh flowers delivered every time a desktop technician works on your computer? Fresh flowers you shall receive, because that is what you have negotiated and paid for, as shown in your SLA. “Service Level Management works with customers to ensure expectations and service quality match,” right? So don’t expect riveting, engaging, interactive, fun, thoughtful training in an online environment… you’re not going to get it… so you certainly shouldn’t be paying for it. If a sales rep tries to tout online training as a benefit and not as the reduction in service that it truly is, you are being duped. This isn’t to say students can’t have a good experience via an online class. Online students should expect clear, straightforward, no-frills, Powerpoint-intensive instruction with minimal interaction via an online method. If a student is disciplined to shut Facebook off, then it’s do-able. But the moment another browser window is open, all bets are off.